During yesterday’s all day coverage of events surrounding our nation’s biggest tragedy on American soil, was an episode the Discovery Channel aired called: Killing bin Laden. It is well-known around the world who is responsible for carrying out the mission that killed the # 1 most wanted terrorist, responsible for the attacks on 9/11–no thanks to the neighbor of Al-Qaeda leader’s compound who tweeted about it soon after the mission was complete. Before then very little, if anything was known about the U.S. Navy component of Joint Special Operations Command, often referred to as SEAL Team Six. They liked it that way. In order to safeguard the United States, their missions as well as the men themselves it is imperative that they live in secret. The wives of the team are often briefed about what they can and cannot say about their husbands duties; not that they know much to begin with. It has been said that a member of a SeAL Team is born and not made. It takes special men–usually with Type A personalities, highly intelligent and have the endurance, both mental and physical of a herd of wild horses. They even have their own “swagger” recognized only by other SeAL members. Missions of the utmost importance to our nation and our allies security are all Top Secret and involve very high risk situations–are given to this team. 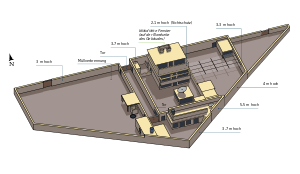 The mission to kill Osama bin Laden took place 10 years after the Sept. 11 attacks on May 1, 2011 and was so Top Secret that, although the team had trained for months prior, using an exact replica of the compound in Abbottabad, Pakistan, did not know who the target was until they were in the air headed to his location. It is said that upon finding this out, the team was ecstatic. The mission took 40 minutes. 20 minutes to kill everyone in the compound and the next 20 to gather intel and load it as well as the body of our enemy on the Chinook Helicopter and head back to base. In August of that same year, 3 months after the mission a helicopter flying over Afghanistan holding 22 members of the elite Team 6 as well as other Americans was shot down by enemy fire. All 38 passengers were killed. There is controversy surrounding the deaths and most of the concerns are coming from the families of the men who successfully carried out the biggest mission our counties ever seen, but that’s a blog for another day. If you’d like to know more information on the creation and the man responsible for Team 6, follow the link below.